Mud, mud, glorious mud! In this lesson, we're going to take the plunge and learn how to draw a cartoon hippo that will really create a splash with your family and friends. So, let's pick up our pencils and get started on our awesome illustration! Hippos are amazing creatures native to Africa, whose nearest living relatives are whales and porpoises. These river-dwelling giants can weigh up to three tonnes and are recognizable by their huge jaws, short legs and amazing size. So, to get started with how to draw a carton hippo, let's sketch out a large circle which intersects with a smaller oval on the right-hand side. This will now form the basis for our epic illustration. Now that we've got the basic outline, we can add some more details to start making our hippo cartoon more recogonizable. First of all, draw an angled curve just above the smaller oval shape, with another simliar one below. For the next step in how to draw a cartoon hippo, draw three small curves just beneath the large circle – these will eventually become the legs in our hippo cartoon! Our epic illustration is really starting to take shape, so now let's start adding some features to really bring our hippo cartoon to life! Remember the curve you drew above the head in the previous step? Let's now add some ears to this shape by drawing two upside down 'U' shapes either side. Next, draw another curve at the side of the head which will form our hippo's cheeks. After this, lets add some huge nostrils to our hippo cartoon – these are basically the same shapes as the ears. Another prominent feature of our hippo is his huge teeth, so we can add those now by drawing two rectangular shapes at the bottom of the smaller oval shape. Finally for this stage, let's add those short, stubby legs to our cartoon hippo by joining the lines we drew earlier to the body. Don't be fooled by these little legs, though – a hippopotamus can reach speeds of up to 30 km per hour and can easily outrun a human! STEP-4: Adding Some Hippo Personality! 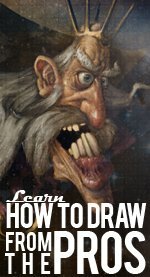 Are you enjoying learning how to draw a cartoon hippo? Our hippo cartoon is starting to look awesome, so let's add some more details to give this mud-loving giant some real personality! Let's start off by sketching in the inner ears as in our illustration, then add some eyebrows to give the face some expression. Our hungry hippo always has a smile on his face and likes nothing better than chilling out in the water and spashing in the mud with his friends! He doesn't mind people joking about his huge size, either – he's got a very thick skin! Next, draw two small oval shapes for the eyes, followed by the inner nostrils. Our hippo cartoon also needs a tail for swishing around in the water, so draw a small one on the left-hand side of the body as in our illustration. Finally, let's finish off those feet by drawing an upside-down 'W' shape on each foot – our hippo cartoon now has toes! STEP-5: Time for Some Color 'Mud'ness! Now that our hippo cartoon is all drawn out, it's time to get stuck in to some colour 'mud'ness and finish off our awesome African giant!First of all, draw the outline in dark purple, then rub out and lines you don't need. You can also use this same shade for filling in the inner ears and eyebrows. Next, take a medium shade of purple and color in that huge body – mud is very good for the skin and keeps our river-dwelling buddy in tip-top condition! After this, color in the eyes using a black pen, remembering to leave a small area white to represent highlights. For the final step in how to draw a cartoon hippo, take a light yellow color and fill in the toes of our hippo cartoon. There, he's ready to jump into the mud and cool down! We hope you enjoyed creating this awesome hippo cartoon – why not try drawing some water around him, or better still, a huge puddle of mud? We'll see you next time for more artistic animal fun!